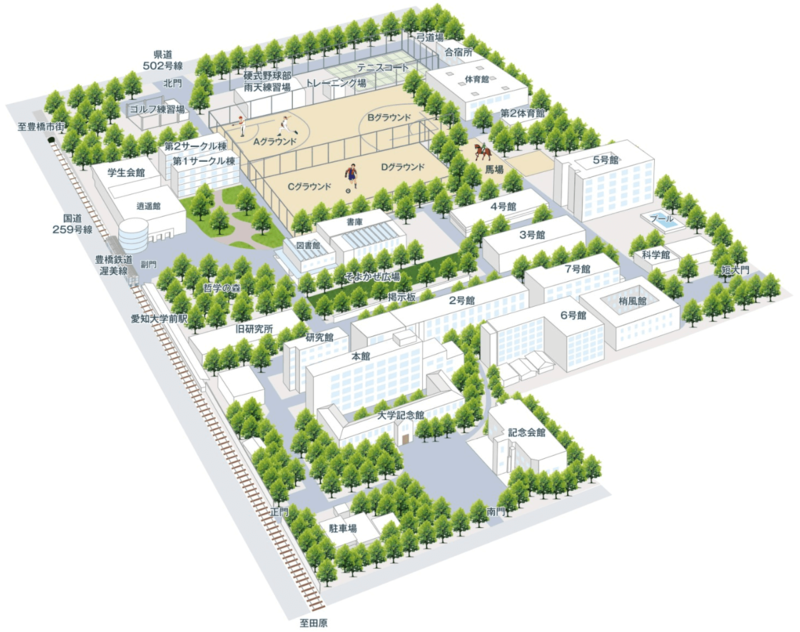 Aichi University was established in Toyohashi City in 1946, immediately after World War II. Since then, the university has accumulated excellent academic results. 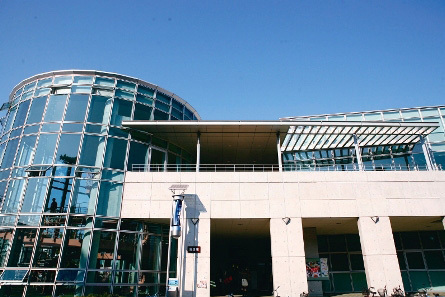 Located in Toyohashi, which has seen the development of various industries, such as advanced agriculture, fisheries, automobiles, and machinery, the Toyohashi Campus provides an optimal academic environment surrounded by rich nature. On a vast site endowed with lush greenery, advanced education and research facilities as well as historic structures built prior to the foundation of the university are placed in a functional layout. 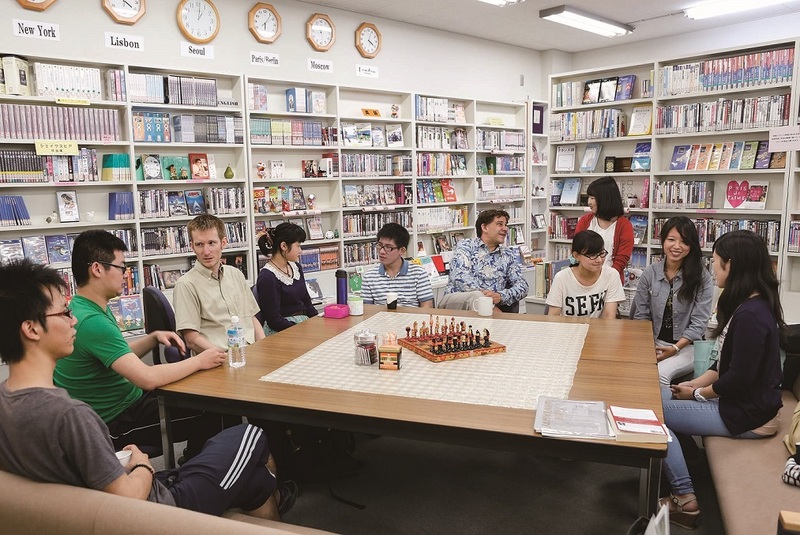 Equipped with sports facilities and welfare service facilities, the Toyohashi Campus offers the best environment for student life. Moreover, to meet the growing need for lifelong learning in the local community, various education programs, including Open College programs, are offered at the Confucius Institute and other facilities. Thus, the campus is open to both students and local people. On the spacious campus, students can enjoy its historic and academic atmosphere. In buildings on the campus, there are many places where students can relax, enjoying a lush green view through glass windows. These are also perfect places for them to have lunch chatting with their friends at a seminar or club. Situated in the southeastern part of Aichi Prefecture, Toyohashi City is a core city with highly developed commerce and industry in the east Mikawa district. The Port of Mikawa, which functions as a domestic and global logistics hub, has long been ranked first in Japan in the number of imported vehicles and their import value. Meanwhile, due to its level terrain and mild climate, the city has long been ranked among the top in the country in agricultural output, supplying various agricultural and livestock products to consuming areas in the Chukyo and other regions. Moreover, as a reflection of its history as a castle town, the city has a rich traditional culture represented by Tezutsu hand-held fireworks, which is pervasive in the lives of citizens. 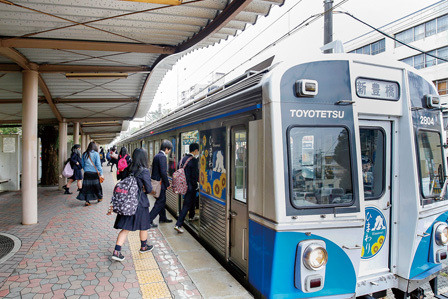 In the area surrounding Toyohashi Station, commercial facilities and an art theater have been newly established, while streetcars are still in operation in the center of the city, which provides the city with a modern yet nostalgic atmosphere. 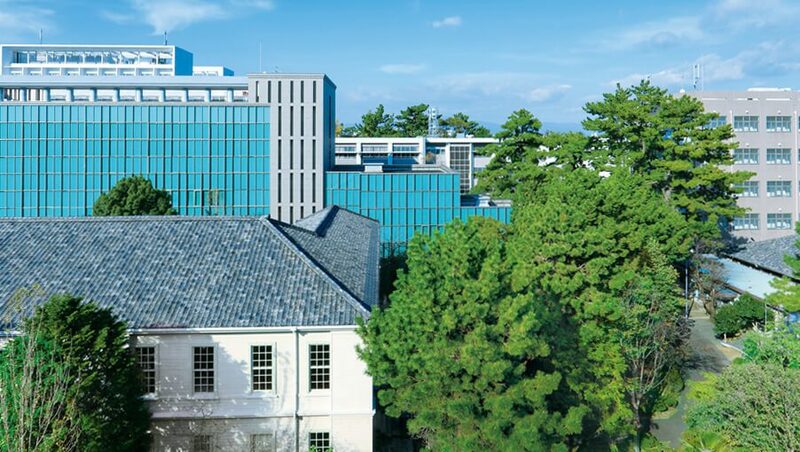 Aichi University, established here in 1946, has fostered individuals who can play a core role in regional revitalization as members of the local community. Surrounded by rich nature and profound traditional culture, this spacious campus gives students a sense of warmth and familiarity. Aichi Daigakumae Station is about six minutes by train (Toyohashi Tetsudo Atsumi Line) from Toyohashi Station on the JR or Meitetsu Line. The station is next to the gates of the university. Pass through the ticket gate, and you'll see the campus right away. With books and visual materials helpful for foreign language learning, the facility is suitable for English and Chinese learning through e-learning using online educational materials. 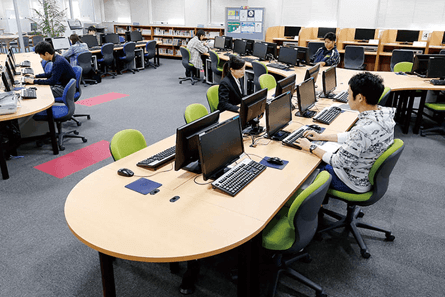 The Information Media Center is furnished with about 900 PCs that can be used to access the Internet across the three campuses. Diverse facilities, such as the Media Zone equipped with DVD and other software contents and hardware, are available. The Learning Commons is a facility available for group learning. 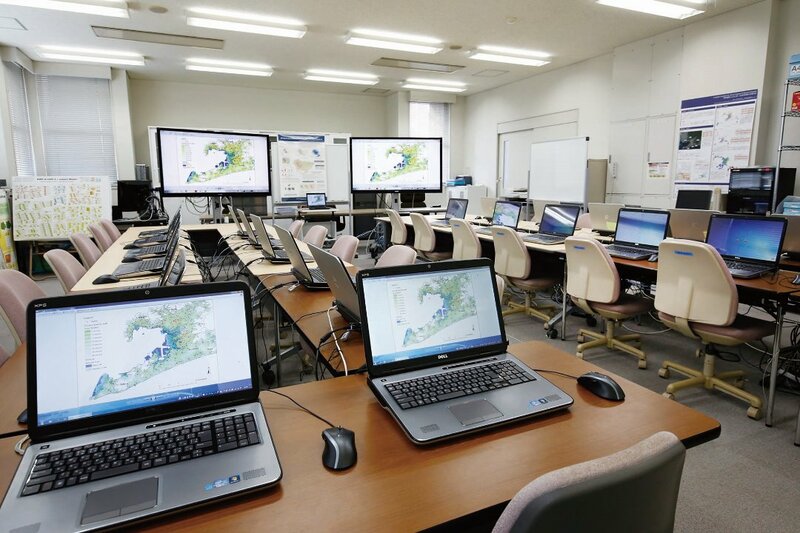 Equipped with electronic blackboards, ICT tools, and PCs for rent (available in the library within the facility), it provides students with a space to practice giving presentations and have active discussions. In an environment furnished with technical equipment and sophisticated facilities, students mainly majoring in Media Arts can do practical work connected with their studies. PCs installed with the latest version of GIS software and a variety of peripheral devices, including a large scanner, are available. This building has a collection of stores, including those that provide books, foods and drinks and other items necessary for campus life as well as a cafeteria that becomes crowded with people at lunchtime. On the first floor of this building are a cafeteria and a lounge. The second and third floors house a conversation lounge exclusively reserved to junior college students and other female students as well as the rooms for students' clubs and circles. Students come here to relax during a recess and in their spare time. 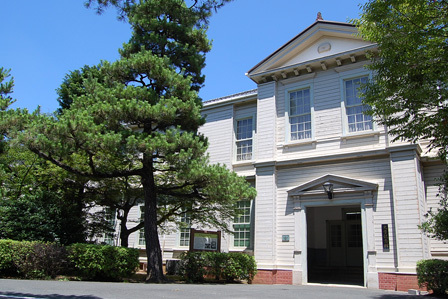 The university memorial hall (former main building) has a dignified air of the Meiji Era. 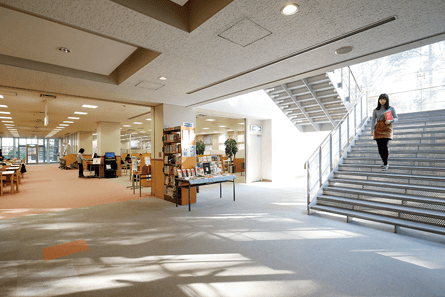 A walk on its long wooden corridor gives you a sense of the long history of Aichi University. The university has a library on each of its campuses, possessing a total of 1.76 million volumes - mainly books on the related academic fields. This number of volumes is far greater than the average of private universities (about 300,000 volumes) and that of national universities (about 1.11 million volumes). The book search system that is available around the clock and self-study carrels, among other things, make the libraries convenient to use.